You'll have a front-row view every. single. night. Pool or ocean? Why not both? The onsite restaurant lets you munch on the best Hawaii has to offer. Fitness fanatics rejoice! The high-end fitness center lets you work out in style. Huge windows in both the lobby and your condo let the ocean air just pour in. The Ritz Kids Lounge features a variety of fun activities. The onsite restaurant, BLT Market, provides poolside dining and drinks. 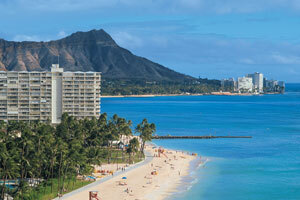 The Ritz-Carlton Residences in Waikiki Beach will wow even the most demanding travelers – it’s just that luxurious. It’s located in the heart of Waikiki amid countless shops and dining, but don’t be surprised if you end up spending most of your trip at the resort. Five-star ratings keep rolling in thanks to great amenities and an outstanding, attentive staff. The awesome service begins the minute you arrive, as a smiling staffer greets you with cool towels, refreshments (splash of rum optional) and, of course, leis. The indoor/outdoor lobby and tropical arrival garden are so gorgeous, you’ll be tempted to just set up camp right there. Don’t worry, your residence suite will have just as much wow factor. If the crew’s a bit peckish after unpacking, onsite dining options abound. Combine lunch with poolside lounging at the Pool Bar & Restaurant. Work on your summer glow (no matter the season – it’s Hawaii!) as attentive employees bring you snacks and beverages; meanwhile kiddos will have a blast playing Sharks ‘n Minnows in the heated pool. Looking for some couple’s time? The Ritz Kids Lounge onsite keeps kids engaged and entertained with activities focusing on travel, discovery, and the environment. Meanwhile the grownups can hit the adults-only pool for a tranquil swim and cocktail in a cabana – or get a couple’s massage at the spa. As easy as it would be to never leave the resort grounds, the locale is easy walking distance from Waikiki’s gorgeous, pristine beaches. Gather the crew, grab the sunblock, and swing by the concierge desk for a complimentary beach bag with towels and water before heading out. It’s a leisurely ten-minute stroll through Fort Derussy Beach Park to get to the beach – take your time and admire the local fauna and flora (many plants have informational placards) along the way. Studios and one- to three-bedroom condo suites are chic and stylish, spacious and inviting. Every suite has a fully equipped kitchen with modern appliances fit for a foodie, along with a dining area for a family dinners. Embrace your inner chef and prepare a DIY dinner party to celebrate a vacation perfectly-planned. Open up the doors to your personal lanai (that’s island-speak for balcony, by the way) to let in some light and an ocean breeze. Enjoy your morning coffee brewed by your Nespresso machine out in the fresh air while admiring postcard views of Waikiki. You won’t have to leave the grounds for upscale dining. For uber-fresh seafood head to Sushi Sho (Hawaii is home to some of the best Japanese food you’ll have). The BLT Market is a casually elegant restaurant with swanky mid-century modern décor, while the Lobby Bar offers great happy hour specials. At the nearby beaches you’ll find all the island must-dos like snorkeling, surfing and paddle-boarding. For a quintessential Hawaiian adventure with the whole family book a sailboat excursion at Holokai Catamaran to go sea turtle- and dolphin-spotting. - Kids stay free! Children 17 years old and younger stay free when using existing bedding. In the heart of the action, Waikiki Beach is lined with high rise resorts, delicious restaurants, and a hopping nightlife. Lounging on the sand, you can make out the gorgeous emerald cliffs of Diamond Head in the distance.